Coco Chips consists of a blend of 50% coir and 50% chips, making it a reliable, long-lasting, and easy to use substrate for hydroponic and soil systems. The chips are made from the same high-quality coconut husk as Nutrifield coco premium but are minimally processed for a larger particle size. The RHP certification ensures that the coir maintains a high level of consistency and quality, is pest and disease free, thoroughly rinsed, pH stabilised, and pre-buffered with calcium. Coco Chips have a high capacity for liquid retention and high friability, which ensures that nutrients remain present and available to plant root systems. Additionally, the larger chip size increases aeration and drainage, and is more resistant to breakdown which promotes longevity. Coco Chips are a long-lasting substrate for excellent plant growth. The ideal blend of coconut fibre and pith (the spongy material that binds the coconut fibre in the husk) in Nutrifield Coco Premium Chips Blend 50/50 allows for a high degree of air flow to the plant roots. As Nutrifield Coco Premium Chips Blend 50/50 does not compress like soil, it retains air pockets within the substrate, which allows for air movements throughout the substrate. The increased aeration inhibits the establishment of anaerobic microbes in the substrate, which tend to be pathogenic. 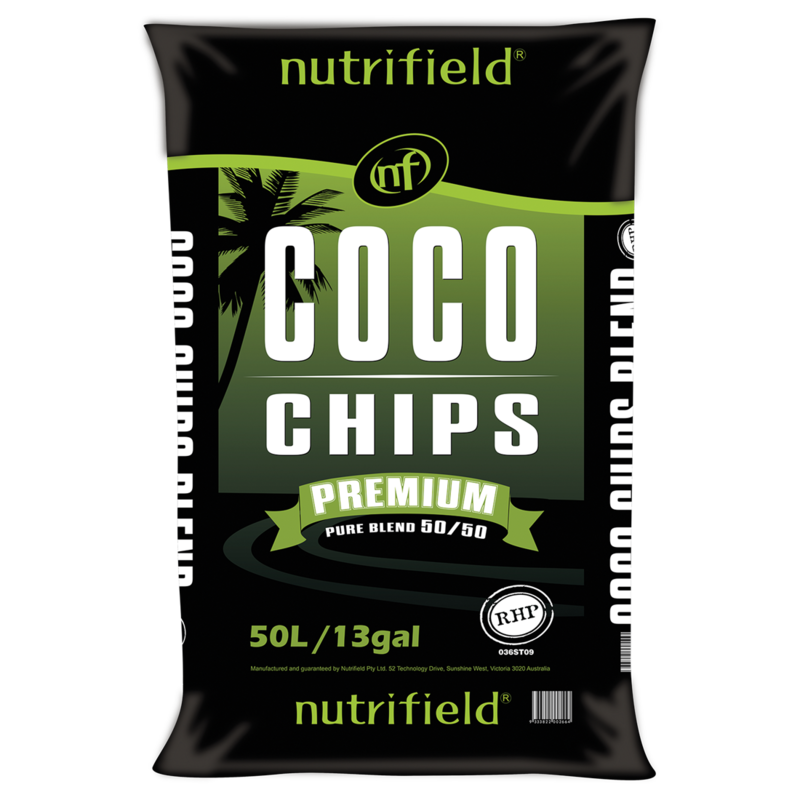 Nutrifield Coco Premium Chips Blend 50/50 is a minimally processed, biodegradable substrate. While still offering many of the same attractive qualities as premium coir, Nutrifield Coco Premium Chips Blend 50/50 is more resistant to decomposition meaning it can be used for longer growing cycles.